This KwaZulu-Natal nature reserve in uKhahlamba Drakensberg Park, South Africa, offers breathtaking views of deep valleys, grassy plateaus and craggy mountains. Giant's Castle Nature Reserve is known for its magnificent San rock art, fabulous hiking and invigorating climate. This KwaZulu-Natal nature reserve is an historic place, and home to majestic Eland and noble Bearded Vulture. This beautiful reserve was named in honour of the peaks of the Drakensberg Mountains, whose silhouette resembles that of a sleeping giant. 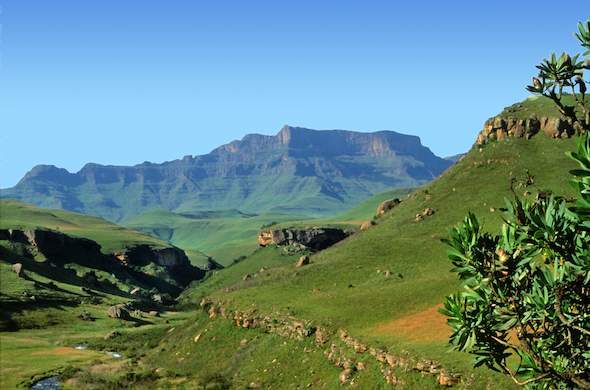 The uKhahlamba Drakensberg Park in KwaZulu-Natal, South Africa, is a World Heritage Site. Giants Castle Nature Reserve occupies the central section which is approximately 4 hours drive from Johannesburg and 3 hours from Durban. Favourite activities here include hiking, mountain climbing and trout fishing. Guests can see fascinating ancient rock art created by the historic San people that once inhabited this spectacular area. This KwaZulu-Natal nature reserve not only provides guests with a great opportunity to view wildlife at close quarters, but also a unique cultural and historical experience. A visit to the Main Caves Museum is a must for insight into the world of the amazing San people (Bushmen), their culture and way of life. Another highlight is the 'Vulture hide', where visitors can view Bearded Vultures and other endangered species feeding in winter. The Rock Lodge Conference Centre is one of the most unique in the country. Built into a hillside overlooking the Bushman's River with Giants Castle as a backdrop, the centre incorporates the surrounding freestanding natural rock into its conference lounge wall. This fully equipped venue has a boardroom and can seat up to 70 delegates, or around 120 guests for wonderful weddings and other intimate gatherings. The surrounding wildflower garden provides a tranquil setting. A visit to Giant's Castle Nature Reserve in the Drakensberg, South Africa, offers guests the privilege of entering the remarkable world of the San (Bushmen) as well as the opportunity to study a varied and exciting range of habitats. The historic Giant's Castle Nature Reserve is home to the Bearded Vulture and majestic Eland antelope. This Drakensberg nature reserve lies in a World Heritage Site in the KwaZulu-Natal province of South Africa.